Midnight Riot has been described as Harry Potter grows up and joins the fuzz. Not quite sure that captures the book, but it’s not bad. Peter Grant is a beat cop ready to move forward with his career. His hopes for something exciting are dashed, though, when he is assigned to the most boring, dead end position available to cops. Basically, it’s where cops are put so they can’t mess things up for themselves or other cops. Before he starts this new beat, though, he interviews a witness to a strange murder. Not many people can see ghosts, let alone interview them. Not many of those people are cops. This brings him to the attention of Detective Chief Inspector Thomas Nightingale, who is in charge of a very small unit within the Metropolitan Police Department (better known to Americans as “Scotland Yard”). Actually, the unit has only one human in it, until Nightingale reroutes Grant’s career and makes it a two human department. Nightingale’s department is charged with making sure the paranormal keep the queen’s peace. Sometimes that means brokering a peace deal between the king and queen of the Thames and their offspring. Sometimes that means taking violent action with permanent effect against a pair of vampires who have taken up residence in a house. And sometimes it means chasing down a revenant–a ghost–who has started a new afterlife career as a serial killer. Peter Grant is a delightful protagonist. He is mixed race, with a scientific mind but easily distracted, eager to find the intersection between science and the supernatural. He is an eager apprentice to Nightingale, learning magic and the paranormal denizens of London as he works to solve the mystery behind the one-spirit crime wave haunting his city. 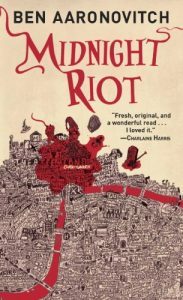 Aaronovitch shows us a gritty and dark London that lives parallel to the city experienced by most people. It is a London with vampires and water spirits, evil ghosts and a dedicated few humans who can see the larger world hidden behind the facade of normalcy. From Midnight Riot he has gone on to write several more (and continues to add to the adventures of Peter Grant). I am looking forward to reading those ongoing adventures–assuming my son allows me to borrow the books once he is done with them. The Rivers of London series of novels & graphic novels is one of my favourites. So glad you enjoyed Book 1 and happy reading as you discover the rest!